Timber Trailer With Loader Crane - Reach It! - Move It! - Crush It! 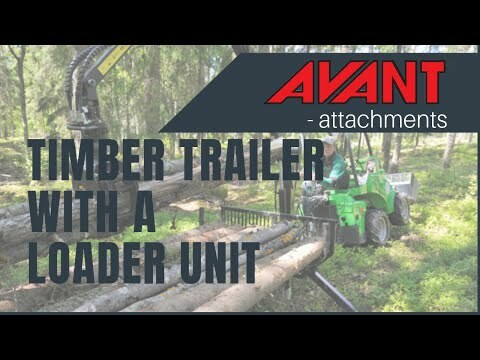 Avant timber trailer with loader crane is an easy-to-use and effective way to load and transport logs. The trailer is coupled to Avant’s trailer coupling and the loader crane to the rear auxiliary hydraulics (double acting outlet required) – very easy and fast connecting and disconnecting. Timber trailer can be equipped as an option with hydraulic 4 wheel drive, powered by hydraulically operated traction rollers. This improves off-road capabilities considerably and is often necessary when driving in the forest. The rollers and their driving direction (forward-reverse) are controlled with a toggle switch from the driver’s seat. The loader crane can be equipped with a remote controlled winch. This way the logs can be winched from places that are harder to reach and the trailer doesn’t have to be moved so much. Thanks to the remote control one operator can easily work with the winch.